The Creek War (1813–1814), also known as the Red Stick War and the Creek Civil War, began as a civil war within the Creek nation. It is sometimes considered to be part of the War of 1812. The war began as a civil war, but the United States was pulled into the conflict in present-day southern Alabama , at the Battle of Burnt Corn . On December 11, 1811, the New Madrid Earthquake shook the Creek lands and the Midwest. While the interpretation of this event varied from tribe to tribe, one consensus was universally accepted: the powerful earthquake had to have meant something. A faction of Creeks known as Red Sticks sought aggressively to return their society to a traditional way of life. Red Stick leaders such as William Weatherford (Red Eagle), Peter McQueen, and Menawa, who were allies of the British , violently clashed with other chiefs within the Creek Nation over white encroachment on Creek lands and the programs administered by U.S. Indian Agent Benjamin Hawkins. Before the Creek Civil War began, the Red Sticks attempted to keep their activities secret from the old chiefs. The first clashes between Red Sticks and the American whites took place when a group of American soldiers stopped a party of Red Sticks who were returning from Spanish Florida on July 21, 1813. The Red Sticks had received munitions from the Spanish governor at Pensacola. The Red Sticks fled the scene, and the soldiers looted what they found. The Creeks, who saw the Americans looting, retaliated with a surprise attack. The Battle of Burnt Corn , as the exchange became known, broadened the Creek Civil War to include American forces. Peter McQueen along with William Weatherford led an attack on Fort Mims, north of Mobile, Alabama , on August 30, 1813. The Red Sticks' goal was to strike at mixed blood Creeks that had taken refuge at the fort. The fighters successfully attacked the fort leaving 400 to 500 dead. Other forts in the area were subsequently attacked by the Red Sticks, including Fort Sinquefield . Panic spread throughout the American Southeastern frontier, which demanded government intervention. Federal forces were busy fighting the British and the Northern Woodland tribes, led by the Shawnee, so Southern states called up their militias to deal with the threat. After Burnt Corn, U.S. Secretary of War John Armstrong notified General Thomas Pinckney, Commander of the 6th Military District, that the United States was prepared to take action against the Creek Nation. Further, if Spain were found to be supporting the Creeks, a strike against Pensacola would occur. Georgia began its preparations by establishing a line of forts along the Chattahoochee River—the modern border between Alabama and Georgia. This action would protect the frontier and allow time to prepare an offensive. Brigadier General Ferdinand Clairborne, a militia commander in the Mississippi Territory, recognized the weakness of his sector on the western border of the Creek territory and advocated a series of preemptive strikes. However, Major General Thomas Flourney, Commander of 7th Military District, continually refused these requests and holding that the American strategy was defensive. Meanwhile, settlers in that region sought refuge in blockhouses. In addition to the actions of Tennessee, Georgia, and Mississippi, Indian Agent Benjamin Hawkins organized the friendly (Lower Town) Creeks under Major William McIntosh to aid the Georgia and Tennessee militias during their actions against the Red Sticks. At the request of Chief Federal Agent Return J. Meigs, known as White Eagle for the color of his hair, the Cherokee Nation voted to join the Americans in their fight against the Red Sticks. 200 Cherokee under the command of Major Ridge fought with the Tennessee Militia under Andrew Jackson. By count of towns, the Upper Creek constituted about two thirds of the Creek Nation. Their towns were along the Alabama, Coosa, and Tallapoosa Rivers in the heart of Alabama. In contrast, the Lower Creek were settled along the Chattahoochee River. Many Creek tried to remain friendly to the United States; but, after Fort Mims, few Americans in the southeast made any distinction between friendly and unfriendly Creeks. At most, the Red Stick force consisted of 4,000 soldiers, possessing perhaps 1,000 guns. They had never been involved in a large scale war, even with their neighbors. Early in the war, General Cocke observed that arrows "form a very principal part of the enemy's arms for warfare, every man having a bow with a bundle of arrows, which is used after the first fire with the gun until a leisure time for loading offers". The Holy Ground (Hickory Ground), located at the junction of the Tallapoosa and Coosa Rivers, was the heart of the Red Stick Confederation. It was about 150 miles (240 km) from the nearest supply point available to any of the three American armies. The easiest attack route was from Georgia through the line of forts on the frontier and then along a good road that led to the Upper Creek towns near the Holy Ground. Another route was north from Mobile along the Alabama River. The most difficult, Jackson's route of advance, was south from Tennessee through a mountainous and pathless terrain. Although Jackson's mission was to defeat the Creek, his larger objective was to move on Pensacola. Jackson's plan was to move south, build roads, destroy Upper Creek towns and then later proceed to Mobile to stage an attack on Pensacola. He had two problems: logistics and short enlistments. When Jackson began his advance, the Tennessee River was low, making it difficult to move supplies, and there was little forage for his horses. Jackson departed Fayetteville, Tennessee on October 7, 1813. He joined his cavalry in Huntsville and crossed the Tennessee, establishing Fort Deposit . He then marched to the Coosa and built his advanced base at Fort Strother. Jackson's first successful actions, the battles of Tallushatchee and Talladega, occurred in November. The arrival of the 39th United States Infantry on February 6, 1814, provided Jackson a disciplined core for his force, which ultimately grew to about 5,000 men. After Governor Blount ordered the second draft of Tennessee militia, Cocke, with a force of 2,000 six-month men, once again marched from Knoxville to Fort Strother. Cocke's men mutinied when they learned that Jackson's men only had three month enlistments. Cocke tried to pacify his men, but Jackson misunderstood the situation and ordered Cocke's arrest as an instigator. The East Tennessee militia reported to Fort Strother without further comment on their term of service. Cocke was later cleared. Jackson spent the next month building roads and training his force. 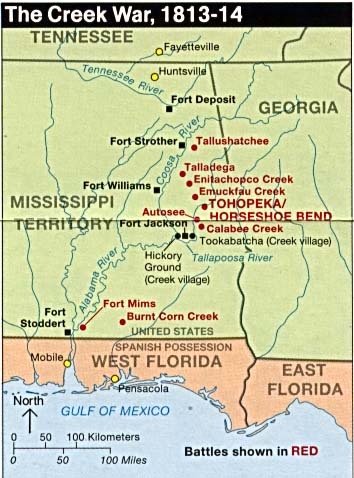 In mid March, he moved against the Red Stick force concentrated on the Tallapoosa at Tohopeka (Horseshoe Bend). He first moved south along the Coosa, about half the distance to the Creek position, and established a new outpost at Fort Williams . Leaving another garrison there, he then moved on Tohopeka with a force of about 3,000 effectives augmented by 600 Cherokee and Lower Creek allies. The Battle of Horseshoe Bend, which occurred on March 27, was a decisive victory for Jackson, effectively ending the Red Stick resistance. In October, General Thomas Flourney organized a force of about 1,000—consisting of the 3rd United States Infantry, militia, volunteers, and Choctaw Indians—at Fort Stoddert . General Clairborne, ordered to lay waste Creek property near junction of Alabama and Tombigbee, advanced from Fort St. Stephen. He achieved some destruction but no military engagement. Continuing to a point about 85 miles (140 km) north of Fort Stoddert, Clairborne established Fort Clairborne. On December 23, he encountered a small force at the Holy Ground and burned 260 houses. William Weatherford was nearly captured during this engagement but was able to escape. Casualties for the Mississippian's were 1 killed and 6 wounded. 30 Creek soldiers were killed in the engagement. Because of supply shortages, Clairborne withdrew to Fort St. Stephens. On August 9, 1814, Andrew Jackson forced the Creeks to sign the Treaty of Fort Jackson. Despite protest of the Creek chiefs who had fought alongside Jackson, the Creek Nation ceded 23 million acres (93,000 km²)—half of Alabama and part of southern Georgia—to the United States government. Even though the Creek War was largely a civil war among the Creeks, Andrew Jackson recognized no difference between the Creeks that had fought with him and the Red Sticks that fought against him, taking the lands of both. 1.9 million acres (7,700 km²) of the 23 million acres (93,000 km²) Jackson forced the Creeks to cede was claimed by the Cherokee Nation, who had also allied with the United States during the war. With the Red Stick menace subdued, Andrew Jackson was able to focus on the Gulf coast region in the War of 1812. On his own initiative, he invaded Spanish Florida and drove a British force out of Pensacola. He next defeated the British at the Battle of New Orleans on January 8, 1815. In 1818, Jackson again invaded Florida, where some of the Red Stick leaders had fled, an event known as the First Seminole War . As a result of these victories, Jackson became a national figure and eventually rose to become the seventh President of the United States in 1829. As President, Andrew Jackson advocated the Indian Removal Act which relocated the Southeastern tribes to the West, across the Mississippi River. George Mayfield, interpreter and spy for Andrew Jackson, later honored by the Creeks for his integrity during treaty negotiations. Holland, James W. "Andrew Jackson and the Creek War: Victory at the Horseshoe Bend." Alabama Review 1968 21(4): 243-275. Kanon, Thomas. "'A Slow, Laborious Slaughter': The Battle Of Horseshoe Bend." Tennessee Historical Quarterly 1999 58(1): 2-15. "The Creek War 1813-1814" from the Horseshoe Bend National Military Park website.